Here is a great recipe for summer and really for the craziness that fall brings as well. 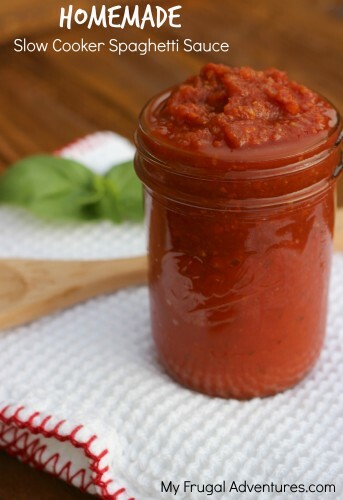 Have you ever tried making your own marinara sauce in the crock pot? It just requires tossing in a few ingredients, set it to low for 6 hours and you will have a ton of yummy marinara to pop in the freezer for quick dinners. I like this recipe because you can customize it to the flavors you like and you will know precisely what is going into your food. This is perfect for clean eating diets because there is nothing but goodness going into the slow cooker. Plus this recipe is so adaptable- it is a great way to use up stray veggies in your fridge. I like to put lots of veggies in this recipe that my family might not otherwise eat so that is one more bonus. Now this can be adapted to any flavors you like but here is a basic recipe that I use. There are several ingredients listed and please note you really don’t need to buy a bunch of stuff. As long as you have garlic, the tomato products, and Italian seasonings (oregano, basil etc..) you are pretty much there. I like to cram extra veggies in so I added several other things I had on hand. 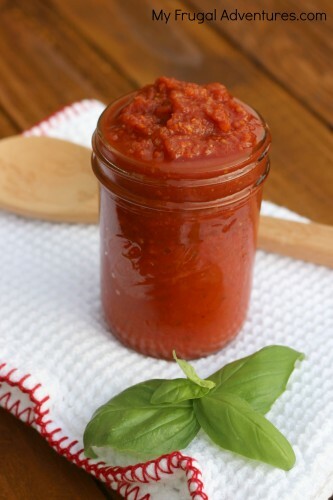 Quick and easy slow cooker marinara sauce. Makes plenty of sauce to pop in the freezer for quick and healthy weeknight meals. Adapt this recipe to whatever flavors you like or whatever you have on hand. Perfect with almost any Italian dish! Add 2 cans of whole peeled tomatoes or diced tomatoes to a crock pot. If you use whole peeled try to mush them up a bit with your hands. Mix in red pepper flakes, one bay leaf and oregano. Roughly chop or tear fresh basil leaves and season well with salt and pepper;. Let simmer on low for about 6 hours. Remove sauce from heat and add to a food processor until you get the consistency you like. Serve immediately or pop in the freezer. So you should get a ton of sauce from this recipe and you can pop it into a freezer bag (fill it and lay flat until the sauce is cool and then stack in the freezer) or I prefer the little plastic Ball Jar freezer cups. Pull this out for a quick meal- pasta, Calzones, spread it on french bread with cheese for a fast lunch, homemade pizzas, use it as a dipper for garlic bread, serve with roasted eggplant or try this simple roasted Eggplant sandwich. This is perfect if you need to drop off a meal to a new mom or a sick friend. Just add a great box of pasta, a hunk of Parmesan cheese, fresh bread from the bakery and a simple green salad. You have a meal that is comforting and easy for the person to put together and looks like you put in a lot of effort. Here is what my yield was for the recipe above. I am going to guess roughly (4) 12oz jars or so of sauce. I keep a mason jar in the fridge for dinners this week and then the freezer jars in different sizes for meals later. A lot of people swear by San Marzano tomatoes but I just used the salted variety from Trader Joes. These are only $1.49 each and all the other ingredients I actually had on hand. So this is a very inexpensive recipe for the quality you will get! You should get about 4 mason jars of pasta sauce. Sometimes I cut the recipe in half and I get 2 full jars from that. The carrots will add a sweetness to your sauce so be careful with how much you add. I have done an entire cup of carrots in the past and found the sauce a little sweet. The tomato paste will thicken your sauce so if it appears to be too thin for your taste, add a little more tomato paste. 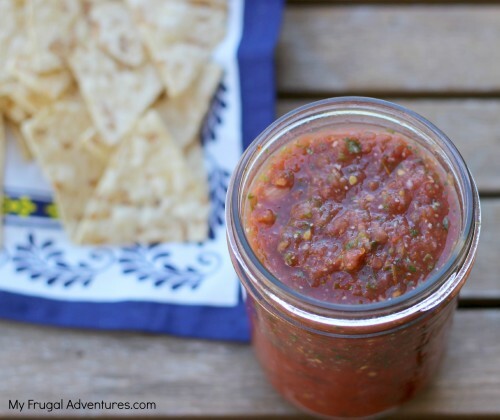 Homemade Blender Salsa- so easy and sooooo good! 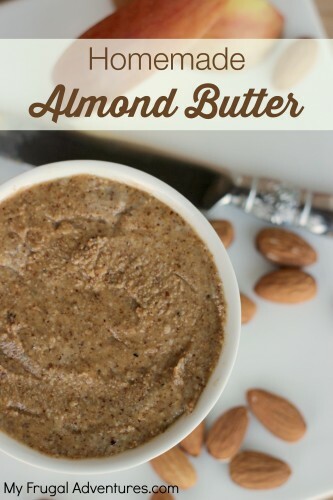 Homemade Almond Butter— this is a staple in our house. Healthy and a million times better then the stuff you buy at the store. This looks so easy and yummy. I love these types of recipes. I was wondering if you have ever tried using fresh tomatoes from the garden and if they worked?? We are always trying to find way to get them all used. Thanks for these great ideas! You can use fresh tomatoes. The kicker is that you need to cook and peel them. I believe you can bake them in a covered casserole dish and I think the peels will come off easily- like red peppers. So a lot more work but much more traditional sauce :). Come share your tomatoes with me! My poor plant has one sad little green tomato on it ;). Jane- yup I added red pepper flakes to get a little kick to mine. I also used the tomato with basil but I think the fire roasted would give you that super yummy smoky flavor. Hi Charlene, if you were using fresh tomatoes, couldn’t you just peel them and add them to the crockpot, since your cooking them anyway? Thank you for the recipe. I made the crock pot sauce and it is amazing!!! My daughter literally stood over the pot as she spooned it out onto chunks of Italian bread. I threw some squash in along with the carrots. I’m thinking jars of this would make a great little gifts at Easter time for my work colleagues. Thanks for posting another awesome recipe. Everyone should try this one. Oh I am so glad Sandra! That sounds really good on the bread! I found (by accident) that freezing and thawing tomatoes makes them easy to peel. Can’t wait to try this frugal (and healthy!) recipe. I’ve been following a similar recipe for quite some time. Lots of extra veggies and nobody knows they are eating something nutritious. The recipe I use adds a cup of red wine. The alcohol cooks out, but leaves a wonderful flavor! Mrs Kelly- I have used red wine when I have it on hand as well. For this post though I tried to put up a recipe that people can just grab things they already have on hand. I didn’t want anyone to have to run out and buy bottles of wine to use for the sauce. If they aren’t wine drinkers, the rest of the bottle will go to waste. 🙂 So by all means add your red wine if that is something you do have open already. Renee- I’d love to hear how that turns out for you! Do you know if this could be done with fresh tomatoes and canned?? Can you not put carrots in it?? My son allergic to carrots. Vanesa, You can put any veggies you like or put none at all. It is perfectly adaptable. This recipe looks amazing. Can’t wait to try it. Just a tip for all the the questions about fresh tomatoes. If you drop fresh tomatoes in boiling water for 3 minutes (this is called blanching) the skins slip right off. When I make sauce, I blanch them, then quarter them so I can slip the seeds out, then on with the recipe. I use fresh garden tomatoes quite often. Here is my plan – I rinse with veggie clan and then take the stems off – put the tomatoes in the food processor and process until chunky or smooth. Then here’s my trick – let them sit for at least an hour and the liquid that collects on the top I pour into a mason jar for soups, etc. Then I cook them as though they were canned tomatoes in the crock pot for six hours and they are perfect every time! I love the idea of adding carrots for sweetness instead of sugar! I’ve never tried making spaghetti sauce in the crockpot before and now I can’t wait to give it a try! Pinning and will definitely be using your recipe very soon. Found your submission on my Wednesday Whatsits post. Happy to see a fellow lover of Trader Joe’s. The sauce looks amazing! I was looking for a good marinara sauce! I am definitely going to try this! Thanks again for coming and linking up at The Weekend Social. All posts get pinned on our pinterest board! Please be sure to come back next week starting Thursdays at 9PM EST on culinaryflavors.gr ! I hope to see you there! We try not to use canned tomatoes. Do you know how many full tomatoes we would need? This looks like a great summer idea! Hi Suzanne- sorry I am not sure how many tomatoes because the size will depend on the type of tomato you buy. Sad to only have marinara sauce in the summer months :). You can always weigh the tomatoes and just use an equivalent weight.